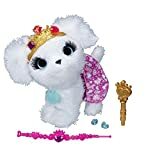 Win best in show when you groom your Princess Pup pet to perfection! This cuddly puppy figure’s hair is super-soft and ready for styling, and she comes with a brush so you can make her look spiffy. You can give her one of 2 hairstyles, and then it’s time to dress her up in her color-reveal dress. The water wand colors her beautiful dress even more, and then you can accessorize her look with the crown and plug-in jewels. Best of all, her collar is a bracelet you can wear! You and your Princess Pup pet will both look gorgeous when you go out together! FurReal Friends and all related characters are trademarks of Hasbro.